After a belated book club this week, followed by a fantastic birthday weekend, I can finally share my thoughts on Anne Brontë’s Agnes Grey. I haven’t read so-called “literature” in a while, so I felt rusty, but the book club babes and I agreed that it was great to be challenged intellectually. One friend even commented that she enjoyed needing to consult a dictionary a few times! Agnes Grey is the perfect novel if you haven’t kept up with the classics since college. It’s a short read with a simple plot: Agnes is a 19-year-old living in rural England who decides to become a governess to help her family who’s struggling financially. A pious young woman with a strict sense of morality and integrity, Agnes must learn how to raise the spoiled children of the English elite. Her patience is tested, first with the Bloomfield brats and then with the Murray girls. Time and again, she is insulted for her shabby clothes, plain looks, and other indications of her lower socioeconomic class. Unlike the gothic romances of her sisters Charlotte and Emily, Anne Brontë’s debut novel is not tragic. Despite her meekness, she attracts the interest of Edward Weston, the town’s parson, who spends his time assisting the poor villagers. It’s not much of a spoiler to say that Agnes and Edward find their happy ending, since the stakes of this story are so low. Other than terrible demon-children abusing animals for their own amusement, you never get the sense of real danger. 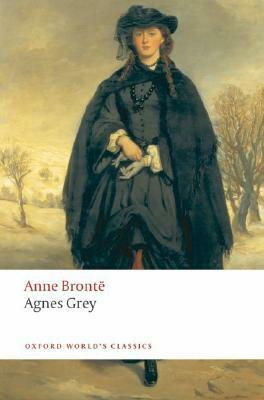 When it comes to literary merit, Agnes Grey is not even remotely in the realm of Wuthering Heights and Jane Eyre. The plot is too straightforward, the style too expositional, and none of the characters ever develop, for better or worse. In fact, as I was reading, I kept giving Brontë a pass given how difficult it was for a woman to write in the 19th century, all the while knowing that she’d never be published today. That said, for what this book is—an autobiographical narrative of one woman trying to remain true to herself in a world of vanity—I appreciated the reading experience. At times it even felt like a Victorian version of “Mean Girls,” with Agnes playing a Cady Heron who never flipped to the dark side. Those of us who were victimized by the richer, more attractive and popular Rosalie Murrays and Regina Georges will feel vindicated when the nice girl wins in the end. Although all the Brontës are creatively successful in their own rights, there’s definitely a reason why Anne lives in the shadow of her sisters and Agnes Grey rarely makes it on required reading lists in school. This entry was posted in Book Review and tagged Agnes Grey, Anne Bronte, book review, classics, literature, Victorian literature by Book Club Babe. Bookmark the permalink.